Trying to conceive can be an exciting time with many changes. However, poor dental health can affect the health and outcome of pregnancies. A study performed at King Edward Memorial Hospital in Perth determined that women who are suffering from periodontal disease are more likely to have a difficult time conceiving and may be more likely to experience complications once they do conceive. According to researchers, a woman’s fertility can be closely linked to her gum health. The study discovered that non-Caucasian women were at the greatest risk of suffering complications linked to gum disease. Periodontal disease, which is caused by oral bacteria, can cause significant damage to oral health, and it can lead to chronic, widespread inflammation. The study focused on nearly 2,000 women who had planned their pregnancies. It evaluated their dental health and asked them questions regarding conception. The study, which was published in “Human Reproduction,” revealed that periodontal disease could delay conception by as much as two months. Other studies have revealed that women with advanced periodontal disease may suffer more complications, including miscarriage and preterm birth. Women who are considering pregnancy can take steps to improve their gum health by maintaining excellent dental hygiene. Brushing after meals and flossing are some of the most basic steps they can take. Visiting our dentist regularly is also important. Although most people can benefit from biannual checkups, women who are trying to conceive may benefit from a pre-conception checkup and more frequent cleanings throughout their pregnancies. 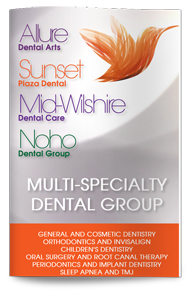 Contact our West Hollywood dentist today to learn more or to schedule your next appointment.